Toronto is a global city state with nearly 100 spoken languages, the third largest theatre center in the world after London and New York, and the fourth largest financial center in North America. The 3 million residents who make up the capital city of the province of Ontario are friendly, proud and on the move. Their City is arguably one of the cleanest and safest cities in the Americas, with a wonderful network of recreational, cultural and transportation facilities. This most livable of cities can also claim world class status for its Toronto Symphony Orchestra, National Ballet of Canada, and the Toronto International Film Festival. Toronto is on the move in the millennium . Toronto wears many Canadian crowns, including new media capital, so we like finding so many web publications in the mold of Carnaval.com's valued added web guide. The long standing paper of record is the Toronto Star, while CitySearch/ticketmaster's toronto.com now dominates the Toronto cyberworld as it does in a growing number of other global Cities. Maintaining links is a lot of work, when particularly displayed this way. Many categories to choose from. The "NonDotCom" Toronto Site. Uncommonly informative. Click the city map for options. LINKS to guides, news, shopping and communities. Among Toronto's 32,000 rooms is the one that is right for you. Visit our Toronto Marketplace to connect with dozens of options, including other discount services, personalized mom and pop booking services, and more featured options. Going to be in Toronto for a while? This extended stay Toronto hotel is for you. The original "village", Global Village Toronto opened in 1997 in the former Spadina Hotel, famous for the many celebrities who stayed and played here over the years. Full hotel/hostel description, a selection of photographs as well as a map and directions. With over 9000 to choose from, it's good to have a plan. All meals subject to: 8% Provincial Tax; 7% GST; 10% Liquor Tax. Average tipping is 15% before taxes. 1 to 5-star ratings searchable by name and cuisine. Featuring their database and most client restaurant participants. Over 8000 listings for Ontario. Powerful search includes neighborhood, landmark, cuisine, style, special diet, price, catering, banquet and name. "Toronto's Ultimate Restaurant & Hospitality Guide" sorts by cuisine, type of establishment and district. Wine, dine & unwind! Includes reviews and articles. Reveals many options for vegetarians seeking a meal in Toronto. Toronto is undergoing a cultural renaissance with the unprecedented building and architectural transformation of close to a dozen major arts and cultural institutions. Toronto zoom street maps with interactive features.Maps.google.com features a very cool zoom map that lets you zoom in on any spot in the world, viewing either street maps or satellite images. Better street detail with simple black & white. 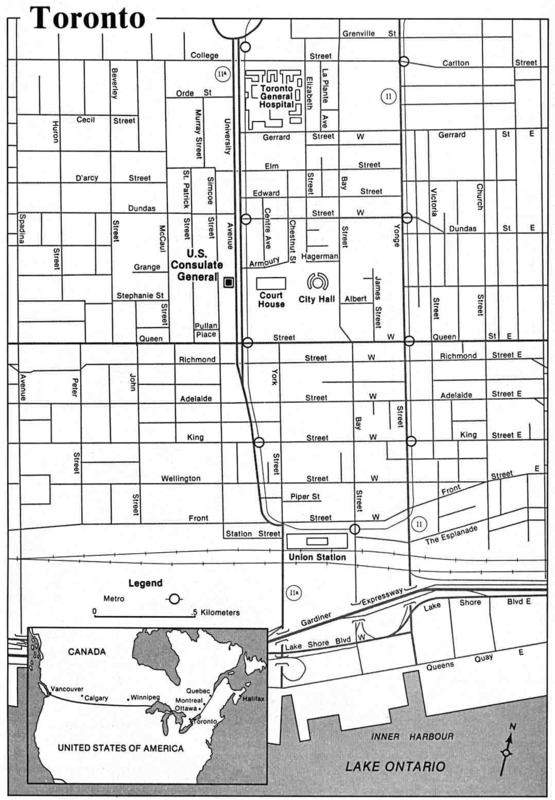 Yonge Street divides the city into West and East, which is a part of the address you'll need unless you get a cross street. Blue street signs indicate a street running North and South while Yellow means an East and West orientation for the uncomplicated grid. Once within the metro area you will be impressed by the efficient combination of subway, bus, and streetcar to get you where you want to go. For further information on TTC routes, schedules and fares, telephone 416-393-4636 (07:00 to 22:00, 7 days a week). A TTC Customer's Guide is available in 15 languages for free at the TTC Customer Centre at 1900 Yonge St., Metro Hall, all other city halls in Metro, public libraries and most cultural centres. There are late-night buses and streetcars, running specific routes every morning from 1 a.m. to 5:30 a.m. Ask for your free transfer. Toronto info: 416-869-3200 (7 daysa week). This service is known as Government of Ontario Transit. GO Transit operates trains over six routes within a 100 kilometer radius of the downtown. The Lakeshore line has all-day service, seven days a week, between Pickering and Oakville. The hub of the 49 station network is the Lakeshore Station at 65 Front Street West (near Bay & York), known as the Toronto Union Statio. It also integrates the web of transit from Toronto Transit Commission. During the winter and adverse weather, you will appreciate this 10 km PATH. This convenient set of underground and indoor routes links 5 subway stations in the downtown area, including Union Station, Eaton Centre and the inter-city bus terminal. 50 MTO traffic cameras updated every 3-5 minutes. Toronto's major taxi companies include Beck Taxi (416-449-6911) or Diamond Taxi (416-366-6868). All are metered, but visitors are well advised to ask the price in advance. "The Ontario government is enticing voters with a 12-year, $17.5-billion plan to extend Toronto’s subway, expand GO Transit service and build two rapid transit lines across Hamilton." The legal age for alcohol in Ontario is 19. Bars must close at 2am. Less is more, with good write-ups on many highlights. Worldsbestbars.com features "Bar of the Moment" and customer reviews. The Molson Amphitheatre at Ontario Place hosts the big shows. "Canada's preeminent concert promoter" does the big shows. Canada's premiere music television channel. Info on Toronto's nightclubs and house music in the city. Toronto party listings, photos, articles, and a web forum. Molten Core's "impeccable taste" displayed as he describes 3 dozen Toronto night spots. Industry web-guide hosted by webmaster Ian Grant. Reggae Routes International Streaming out of Toronto. Tosalsa.com Your guide to salsa dancing and Latin Music in Toronto & Beyond. "Improves our health and may even contribute to our longevity." "We dance, talk to people, take photographs, and hang out. This is our life. We are the TRIBE crew. We bring you greetings from Canada." Committed to the development of arts and culture in the City of Toronto. An internet-based group of arts supporters, dedicated to raising arts awareness and increasing the resources available to Toronto artists and arts organizations. A list of exhibit venues, theatres and organizations. Only New York and London boast greater Theatre offerings. can tell you just what shows will be playing during your visit, and you can even book your tickets in advance here. "One Extraordinary Moment After Another"
A nonprofit musical theatre troupe with an on and off-stage membership of over 100 people. The first company in the nation to devote itself exclusively to producing Canadian plays. Presenting the best in drama, dance, classical and contemporary music, opera, operetta and musicals. Stage Door is dedicated primarily to serving all the theatres of Southwestern Ontario, including Toronto. Stratford, Ontario. The best works of theatre in the classical and contemporary repertoire, with special emphasis on the works of William Shakespeare. Not-for-profit theatre housed in a designated historical building. Internationally recognized for its passionate, intelligent contemporary dance. Founded in 1998 to produce and help promote new, exciting and engaging puppetry works to audiences in the Greater Toronto Area. Dedicated to professional productions of the highest quality - classic or contemporary - from Canada and around the world, written just for children and their families. Canada's national stand-up comedy chain. All you need to know about the top spots to shop plus a lot more. Hilights, reccomended shops & guides. List of stores by category. Attractions, exhibitions, festivals and tours in Toronto. Toronto is home to four major sports teams: the NBA's Raptors, the NHL's Maple Leafs, MLB's Blue Jays, and the CFL's Argonauts. links on Toronto.com's Sports Page. Violent crime is not a major problem in Toronto, although property crime (vandalism, theft) is a problem. Just like in the USA, dial 911 for emergenices (no coin required at pay phones). The Soul of Urban Culture. Toronto's leading daily now offers access to its search engine. A national paper based in Toronto. "Toronto's Other Voice" of 30 years. Founded by revolutionary television producer Moses Znaimer. Now in Vancouver as well. Sharenews.com, is Canada's largest Ethnic Newspaper. Free listings for all organizations and businesses which serve the gay, lesbian and bisexual communities of Canada. There are many business ties between Toronto and Sao Paulo, Brazil (the world's third largest City), and both are top manufacturing cities. A quarterly publication published in Toronto.